Spanning 83rd to 86th streets between 11th and 13th avenues, the Dyker Heights neighborhood – seasonally dubbed "Dyker Lights" in a nod to the display – attracts an estimated 150,000 visitors every year. It started 25 years ago with Lucy Spata's initial display. The rest of the neighborhood followed suit. And those that complained, well, Spata says she invited them to move. Lucy and her husband Angelo decorate their home themselves. 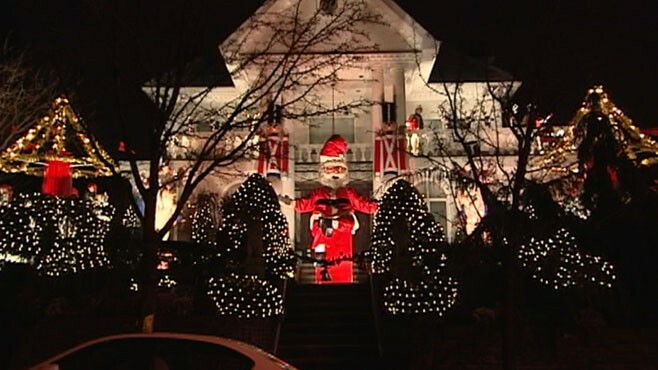 Her husband presented her with a pair of 15-foot nutcrackers as a gift this year. The figures arrived on flatbed trucks, she said. Spata's display is comprised of 30,000 lights, armies of illuminated soldiers and choirboys, a crèche, miniature villages, motorized dolls, and guest appearances by Elmo, Frosty the Snowman and Santa Claus. Florence Polizzotto is also among those who are keeping the neighborhood tradition alive and well. Her display includes a 25-foot Santa that speaks, 29-foot toy soldiers that wave their arms and a quartet of 10-foot tall dancers that pirouette to the music of the "Nutcracker Suite." Also integral to the tradition are Tony Muia, who runs A Slice of Brooklyn Tours, and Lou Nasti, owner of Lou's Mechanical Displays in Brooklyn. Nasti has nearly 40 years of experience in the design and manufacture of animated displays. +GMA Lights Up America: San Francisco Shines!